The first thing I tried to do for this looking outwards was to search for twitter bots outside of the Western countries of the world. I was really curious to see what an Asian bot might look like – or one in Spanish. It turned out to be surprisingly hard! Made me wonder whether there was a culture of Twitter bots outside of the U.S. and Europe. 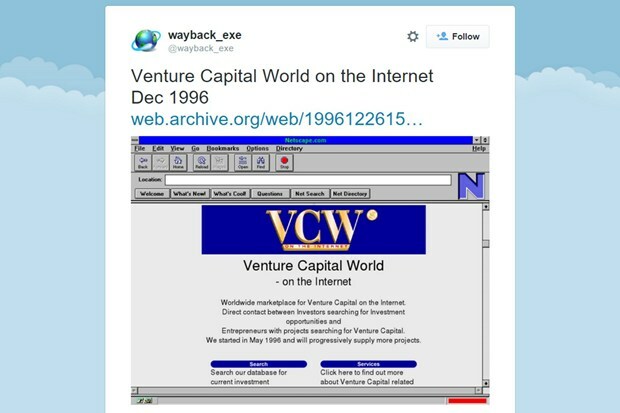 It finds images of old websites in the Internet Archive, frames then in a Netscape browser and tweets them. There’s something very neat about using a new tool/communication device (what exactly is a bot?) to surface something so clearly outdated such as a website from 1997. Scrolling down an endless list of images it’s hard not to wonder at how quickly the Internet has changed – both in the way it operates and in its role in our lives. 23 petabytes is astounding – but I wonder whether our current Internet could possibly be archived in the same permanent way these next years. It is so transient and so volatile – should we still assume that everything we put out there will be stored in Google’s servers for someone to query in 20 years? I salute the creator for also including a link to the original Internet Archive page – a direct invitation to learn more about what he or she has posted.